Nate and Cat love inventing and although things often go wrong (a mechanical dresser makes great gashes in Nate’s bedroom wall) the friends’ passion for creating gadgets is undiminished. They make a good team as Nate is the one who comes up with the ideas and plans while Cat is an excellent technician. As a non-technician, I found the descriptions of the inventions and how the pair work together most convincing. And, in this post feminist age there is no self-consciousness at all about a girl being the techie one. 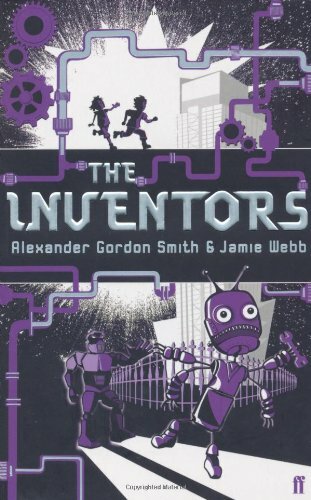 The chance to win a scholarship to study for a year with Ebenezer Saint, ‘the most amazing inventor on the planet’, is too good to miss and the friends eventually find themselves on the awe-inspiring campus of Saint Solutions with all the resources they could ever need to make their inventions available. Ebenezer Saint turns out to be an eccentric in the Willy Wonka mode. He appears eager to help the young inventors so why do Nate and Cat have the uneasy feeling that something is wrong? Full of situation comedy (and quite a few tasteless jokes), Smith and Webb’s action packed cliff-hanger of a novel will both amuse young readers and keep them on the edge of their seats. Tension and suspense build up to a crescendo: while Nate and Cat are good at overcoming obstacles, will Ebenezer Saint outwit them? An energetic, pacey, funny first novel that hurtles along.